No to High Speed 2: New Electrostar order in the offing? New Electrostar order in the offing? Reports are that a further build of Bombardier Electrostars could be ordered by Southern, for use on the Brighton main line. This would be good news for Derby. It is possible to have a comfortable ride on the Southern Electrostars, but really they are an inner suburban design and the best implementation of the type is the class 378 for London Overground. For longer-distance services, they would be better with modifications to the original design, which has its origin in the British Rail Networker, an inner suburban design developed in the 1980s. The most beneficial change would be to move the doorways to the ends. This would have four advantages. The gap between platform and train would be constant, regardless of the curvature of the track. This would avoid the large gaps that passengers have to negotiate at stations with sharply curved concave platform faces and consequently reduce station dwell times. With a single saloon 14.4 metres long, there would be more flexibility in arranging alternative seating layouts. Internal doors at the entrance to saloons would be possible, thereby reducing the load on the heating and ventilation system when the train doors were open. End doors give better structural integrity than can be achieved when it is necessary to provide large openings in the bodyshell one-third of the way from each end. This might lead to a reduction in weight. The second, though more major change, would be a modification of the bodyshell cross section to provide extra width at floor level, and possibly also at cantrail level. The lower bodyside curvature appears to be unnecessary, since the external steps project into the space in any event. 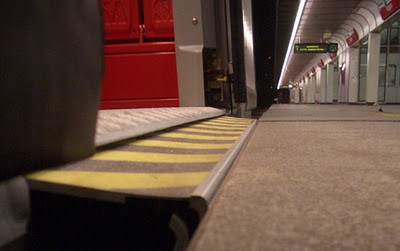 The third modification would be to raise the floor level to the former standard of 1.300 mm above track level. This would provide additional width at floor level and allow space for a proper step instead of the present awkward and hazardous half-step. The fourth modification, would be the fitting of proper retractable steps such as this one from Knorr-Bremse, as well as wheelchair access ramps. Again, in addition to safety benefits, this would cut station dwell times especially at busy stations with curved platforms such as East Croydon and Clapham Junction.